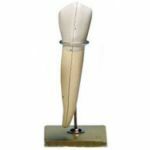 Replica of canine molar. 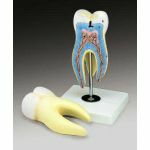 Endo model has root canals and pulp for simulation of root canal procedures. Allows for drilling with high speed dental burs, cleaning, shaping and canal obturation. Opaque or Non-clear version for advanced practice. See #2532 for CLEAR version to see canals and results for beginning practice. Comes with handle. Quantity discounts available for instructional use.